This article is about the year 1933. 1933 (MCMXXXIII) was a common year starting on Sunday of the Gregorian calendar, the 1933rd year of the Common Era (CE) and Anno Domini (AD) designations, the 933rd year of the 2nd millennium, the 33rd year of the 20th century, and the 4th year of the 1930s decade. January 5: Construction of the Golden Gate Bridge begins. January – The London Underground diagram (designed by Harry Beck) is introduced to the public. January 5 – Construction of the Golden Gate Bridge begins in San Francisco Bay. January 11 – Sir Charles Kingsford Smith makes the first commercial flight between Australia and New Zealand. January 15–March 2 – A teenage girl in Banneux, Belgium, reports eight Marian apparitions, which become known as Our Lady of Banneux. January 15 – Political violence causes almost 100 deaths in Spain. January 17 – The United States Congress votes favorably for Philippines independence, against the view of U.S. President Herbert Hoover. January 23 – The Twentieth Amendment to the United States Constitution is ratified, changing Inauguration Day from March 4 to January 20, starting in 1937. January 28 – "Pakistan Declaration": Choudhry Rahmat Ali publishes (in Cambridge, England) a pamphlet entitled Now or Never; Are We to Live or Perish Forever?, in which he calls for the creation of a Muslim state in northwest India that he calls "Pakstan", which is influential on the Pakistan Movement. Nazi leader Adolf Hitler is appointed Chancellor of Germany by President of Germany Paul von Hindenburg. Édouard Daladier forms a government in France in succession to Joseph Paul-Boncour. He is succeeded on October 26 by Albert Sarraut and on November 26 by Camille Chautemps. The Lone Ranger debuts on American radio. February 1 – Adolf Hitler gives his "Proclamation to the German People" in Berlin. February 2 – A second international conference on disarmament ends without results. It tries to limit the army sizes of the major powers, while Germany is entitled to 200,000; Germany leaves the conference, because a plan postpones the limitations for 4 years. February 3 – Adolf Hitler gives a secret speech to his military leaders, outlining his plans to rearm Germany in defiance of the Treaty of Versailles, and to adopt a policy of Lebensraum in eastern Europe. February 5 – A mutiny starts on the Royal Netherlands Navy coastal defence ship De Zeven Provinciën in the Dutch East Indies. After 6 days, it is bombed by a Dutch aircraft, killing 23 men, and the remaining mutineers surrender. February 6 – The Twentieth Amendment to the United States Constitution goes into effect. February 6–7 – Officers on the USS Ramapo record a 34-meter high sea-wave in the Pacific Ocean. February 9 – The King and Country debate: The Oxford Union student debating society in England passes a resolution stating, "That this House will in no circumstances fight for its King and country." February 10 – The New York City-based Postal Telegraph Company introduces the first singing telegram. February 15 – In Miami, Giuseppe Zangara attempts to assassinate President-elect Franklin D. Roosevelt, but instead fatally wounds the Mayor of Chicago, Anton Cermak. Newsweek magazine is published for the first time in the United States. The Blaine Act passes the United States Senate, submitting the proposed Twenty-first Amendment to the Constitution to the states for ratification. The amendment is ratified on December 5, ending prohibition in the United States. 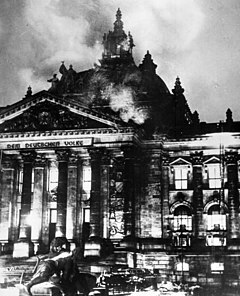 February 27 – Reichstag fire: Germany's parliament building in Berlin, the Reichstag building, is set on fire under controversial circumstances. The Reichstag Fire Decree is passed in response to the Reichstag fire, nullifying many German civil liberties. English cricket team in Australia in 1932–33: The England cricket team wins The Ashes using the controversial bodyline tactic. March 4: Franklin Delano Roosevelt becomes 32nd President of the United States. March 2 – The original film version of King Kong, starring Fay Wray, premieres at Radio City Music Hall and the RKO Roxy Theatre in New York City. Ching Yun University is established in Taiwan. The Mount Rushmore National Memorial is dedicated in South Dakota. A powerful earthquake and tsunami hit Honshū, Japan, killing approximately 3,000 people. Franklin D. Roosevelt (FDR) is sworn in as the 32nd President of the United States. In reference to the Great Depression, he proclaims "The only thing we have to fear, is fear itself" in his inauguration speech. It is the last time Inauguration Day in the United States occurs on March 4. Frances Perkins becomes United States Secretary of Labor and first female member of the United States Cabinet. The Parliament of Austria is suspended because of a quibble over procedure; Chancellor Engelbert Dollfuss initiates authoritarian rule by decree, an origin of Austrofascism. The Great Depression: President Franklin D. Roosevelt declares a "Bank holiday", closing all United States banks and freezing all financial transactions (the 'holiday' ends on March 13). German election, 1933: National Socialists gain 43.9% of the votes. March 6 – Mayor Anton Cermak of Chicago dies of the wound he received on February 15. March 7 – The real-estate trading board game Monopoly is invented in the United States. March 9 – Great Depression: The United States Congress begins its first 100 days of enacting New Deal legislation. March 10 – The 6.4 Mw  Long Beach earthquake shakes Southern California with a maximum Mercalli intensity of VIII (Severe), killing 115 people. March 12 – Great Depression: Franklin Delano Roosevelt addresses the nation for the first time as President of the United States, in the first of his "Fireside chats". The Dow Jones Industrial Average rises from 53.84 to 62.10. The day's gain of 15.34%, achieved during the depths of the Great Depression, remains the largest 1-day percentage gain for the index. Austrian Chancellor Engelbert Dollfuss keeps members of the National Council from convening, starting the Austrofascist dictatorship. Dachau, the first Nazi concentration camp, is completed (it opens March 22). Giuseppe Zangara, the attempted assassin of Franklin D. Rooseveltm, is executed by the electric chair. March 22 – President Franklin Roosevelt signs an amendment to the Volstead Act known as the Cullen–Harrison Act, allowing the manufacture and sale of "3.2 beer" (3.2% alcohol by weight, approximately 4% alcohol by volume) and light wines. March 23 – The Reichstag passes the Enabling Act, making Adolf Hitler dictator of Germany. March 24 – Jewish protesters in New York City call for a boycott of German goods, in response to the persecution of German Jews by the Nazis. March 29 – Welsh journalist Gareth Jones makes the first report in the West of the Holodomor famine-genocide in Ukraine. March 31 – The Civilian Conservation Corps is established, with the mission of relieving rampant unemployment in the United States. April – Last skirmish in the Mexican Indian Wars after 414 years. April 1 – The recently elected Nazis (under Julius Streicher) organize a one-day boycott of all Jewish-owned businesses in Germany. April 2 – In a cricket test match against New Zealand, English batsman Wally Hammond scores a record 336 runs. An anti-monarchist rebellion occurs in Siam (Thailand). The first flight over Mount Everest is made by the British Houston-Mount Everest Flight Expedition, led by the Marquis of Clydesdale, and funded by Lucy, Lady Houston. April 4 – American airship Akron crashes off the coast of New Jersey, killing 73 of its 76 crewmen. It is the worst aviation accident in history up to this date (and until 1950). The International Court of Justice in The Hague decides that Greenland belongs to Denmark, and condemns Norwegian landings on eastern Greenland. Norway submits to the decision. President of the United States Franklin D. Roosevelt declares a national emergency and issues Executive Order 6102, making it illegal for U.S. citizens to own substantial amounts of monetary gold or bullion. Sale of some beer is legalized in the United States under the Cullen-Harrison Act of March 22, eight months before the full repeal of Prohibition in December. The Law for the Restoration of the Professional Civil Service is passed in Germany, the first law of the new regime directed against Jews (as well as political opponents). April 11 – Aviator Bill Lancaster takes off in England, in an attempt to make a speed record to the Cape of Good Hope, but vanishes (his body is not found in the Sahara Desert until 1962). April 13 – The Children and Young Persons Act is passed in the United Kingdom. April 19 – The United States officially goes off the gold standard. April 21 – Nazi Germany outlaws the kosher ritual shechita. Persecution of Jehovah's Witnesses in Nazi Germany begins, with seizure of the Bible Students' office in Magdeburg. Jewish physicians in Nazi Germany are excluded from official insurance schemes, forcing many to give up their practices. The Gestapo secret police are established in Nazi Germany, by Hermann Göring. Editors of the Harvard Lampoon steal the Sacred Cod of Massachusetts from the State House (it is returned two days later). The Jessop & Son department store in Nottingham, England, is acquired by the John Lewis Partnership (its first store outside of London). Gleichschaltung: Adolf Hitler prohibits trade unions. May 5 – The detection by Karl Jansky of radio waves from the center of the Milky Way Galaxy is reported in The New York Times. The discovery leads to the birth of radio astronomy. May 8 – Mohandas Gandhi begins a 3-week hunger strike, because of the mistreatment of the lower castes. In Germany, the Nazis stage massive public book burnings. Paraguay declares war on Bolivia. May 12 – The Agricultural Adjustment Act is enacted in the United States. May 17 – Vidkun Quisling and Johan Bernhard Hjort form The Nasjonal Samling (the National-Socialist Party) of Norway. May 18 – New Deal: President Franklin Delano Roosevelt signs an act creating the Tennessee Valley Authority. May 26 – The Nazi Party in Germany introduces a law to legalize eugenic sterilization. New Deal in the United States: The Federal Securities Act is signed into law, requiring the registration of securities with the Federal Trade Commission. The Century of Progress World's Fair opens in Chicago. Walt Disney's classic Silly Symphony cartoon The Three Little Pigs is first released by United Artists. June – The Holodomor famine-genocide in Ukraine reaches its peak, with 30,000 deaths from man-made starvation each day. The average life expectancy for a Ukrainian male born this year is 7.3 years. June 5 – The U.S. Congress abrogates the United States' use of the gold standard, by enacting a joint resolution nullifying the right of creditors to demand payment in gold. June 6 – The first drive-in movie theater opens in Pennsauken Township, near Camden, New Jersey. June 12 – The London Economic Conference is held. June 17 – Union Station massacre: In Kansas City, Missouri, Pretty Boy Floyd kills an FBI agent, 3 local police, and the person they intended to rescue, captured bank robber Frank Nash. June 21 – All non-Nazi parties are forbidden in Germany. June 25 – Wilmersdorfer Tennishallen delegates convene in Berlin, to protest against the persecution of Jehovah's Witnesses in Nazi Germany. June 26 – The American Totalisator Company unveils its first electronic pari-mutuel betting machine, at the Arlington Park race track near Chicago. The London Passenger Transport Board is founded. Business Plot: Smedley Butler becomes involved in a coup attempt led by Gerald MacGuire against President of the United States Franklin Delano Roosevelt which fails (according to his own testimony in 1934). July 4 – Gandhi is sentenced to prison in India. July 6 – The first Major League Baseball All-Star Game is played at Comiskey Park in Chicago. July 8 – The first rugby union test match is played between the Wallabies of Australia and the Springboks of South Africa, at Newlands in Cape Town. Formation of new political parties is forbidden. The Law for the Prevention of Hereditarily Diseased Offspring is enacted, allowing compulsory sterilization of citizens suffering from a list of alleged genetic disorders. The Four-Power Pact is signed by Britain, France, Germany and Italy. The International Left Opposition (ILO) is renamed the International Communist League (ICL). July 20 – Reichskonkordat: Vatican state secretary Eugenio Pacelli (later Pope Pius XII) signs an accord with Germany. Wiley Post becomes the first person to fly solo around the world, landing at Floyd Bennett Field in Brooklyn, New York, after traveling eastabout 15,596 mi (25,099 km) in 7 days 18 hours 45 minutes. "Machine Gun Kelly" and Albert Bates kidnap Charles Urschel, an Oklahoma oilman, and demand $200,000 ransom. July 24 – Several members of the Barrow Gang are injured or captured during a running battle with local police, near Dexter, Iowa. August 1 – The Blue Eagle emblem of the National Recovery Administration is displayed publicly for the first time. August 2 – The Stalin White Sea–Baltic Sea Canal, a 227 km navigable waterway constructed using forced labour in the Soviet Union, opens, connecting the White Sea with Lake Onega and the Baltic. August 7 – Simele massacre: More than 3,000 Assyrian Iraqis are killed by Iraq government troops. August 12 – Winston Churchill makes his first speech publicly warning of the dangers of German rearmament. August 14 – Loggers cause a forest fire in the Coast Range of Oregon, later known as the first forest fire of the Tillamook Burn. It is extinguished on September 5, after destroying 240,000 acres (970 km2). August 25 – The Diexi earthquake shakes Mao County, Sichuan, China and kills 9,000 people. August 30 – German-Jewish philosopher Theodor Lessing is shot in Marienbad (Mariánské Lázně), Czechoslovakia, dying the following day. Alejandro Lerroux forms a new government in Spain. Leó Szilárd, waiting for a red light on Southampton Row in Bloomsbury, conceives the idea of the nuclear chain reaction. September 26 – A hurricane destroys the town of Tampico, Mexico. October 1 – A failed assassination attempt against Engelbert Dollfuss, leader of the Fatherland's Front in Austria, seriously injures him. October 7 – Air France is formed by the merger of five French airline companies, beginning operations with 250 planes. October 10 – 1933 United Airlines Boeing 247 mid-air explosion: A bomb destroys a United Airlines Boeing 247 on a transcontinental flight in mid-air near Chesterton, Indiana, killing all 7 on board, in the first proven case of sabotage in civil aviation, although no suspect is ever identified. October 12 – The United States Army Disciplinary Barracks on Alcatraz is acquired by the United States Department of Justice, which plans to incorporate the island into its Federal Bureau of Prisons as a penitentiary. October 13 – The British Interplanetary Society is founded. October 14 – Germany announces its withdrawal from the League of Nations and the World Disarmament Conference, after the U.S., the U.K. and France deny its request to increase its defense armaments under the Versailles Treaty. October 14-16 – The new constitution of Estonia is approved only on the third consecutive referendum. October 16 – Parricides committed in the United States by Victor Licata lead to calls for the legal prohibition of cannabis. October 17 – Scientist Albert Einstein arrives in the United States, where he settles permanently as a refugee from Nazi Germany, and takes up a position at the Institute for Advanced Study, Princeton, New Jersey. November 5 – Spanish Basque people vote for autonomy. November 8 – New Deal: U.S. President Franklin D. Roosevelt unveils the Civil Works Administration, an organization designed to create jobs for more than 4 million of the unemployed. November 11 – Dust Bowl: In South Dakota, a very strong dust storm, ("the great black blizzard"), strips topsoil from desiccated farmlands (one of a series of disastrous dust storms that year). The United States and the Soviet Union establish formal diplomatic relations. American aviator Jimmie Angel becomes the first foreigner to see the Angel Falls in Venezuela (they are named after him). November 17 – The Marx Brothers' anarchic comedy film Duck Soup is released in the U.S.
November 19 – Second Spanish Republic: General elections result in victory by the right-wing parties. November 22 – The Fujian People's Government is declared in Fujian Province, China. December 5 – The Twenty-first Amendment to the United States Constitution is ratified, repealing Prohibition. December 6 - U.S. federal judge John M. Woolsey rules that James Joyce's novel Ulysses is not obscene. December 15 – The 21st Amendment officially goes into effect, making alcohol legal in the United States. December 17 - The first NFL Championship game is played. Newfoundland returns to Crown colony status, following financial collapse. The British Plastics Federation (the oldest in the world) is founded. December 23 – Lagny-Pomponne rail accident: A train crash in Lagny, France kills over 200. The Nissan Motor Company is organized in Tokyo, Japan. December 29 – Members of the Iron Guard assassinate Ion Gheorghe Duca, prime minister of Romania. Nazi Germany forms the Expert Committee on Questions of Population and Racial Policy, under Reich Interior Minister Wilhelm Frick. 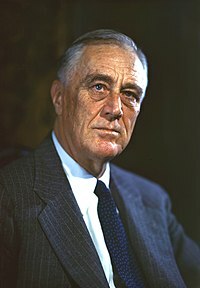 U.S. President Franklin Roosevelt rejects socialism and government ownership of industry. The first doughnut store under the Krispy Kreme name opens in Nashville, Tennessee. 15 million are unemployed in the United States. Turkey concludes a treaty with the creditors of the former Ottoman Empire to schedule the payments in Paris (Turkey succeeds in clearing all the debt in less than twenty years). The first dated Inter-School Christian Fellowship group is started in Australia at North Sydney Boys High School, with the group continuing into the 21st century. The Adélaïde Concerto, a spurious work attributed to Wolfgang Amadeus Mozart, is published as "edited" (actually composed) by Marius Casadesus. ^ Garland, Ken (1994). Mr Beck's Underground Map. Harrow Weald: Capital Transport. ISBN 1-85414-168-6. ^ "Édouard Daladier, un résistant entre paix et guerre". Le Point. October 30, 2013. Retrieved February 18, 2019. ^ Hoffmann, Peter (1988). German resistance to Hitler. Cambridge, Mass: Harvard University Press. pp. 15–16. ^ Ceadel, Martin (1979). "The King and Country Debate, 1933: Student Politics, Pacifism and the Dictators". The Historical Journal. 22 (2): 397–422. doi:10.1017/s0018246x00016885. ^ a b c Williams, Hywel (2005). Cassell's Chronology of World History. London: Weidenfeld & Nicolson. pp. 510–512. ISBN 0-304-35730-8. ^ "Roosevelt Authorizes Beer Sale By Signing Bill For 3.2 Brew", Pittsburgh Post-Gazette, March 23, 1933, p.1. ^ Limberg, Margarete; Rübsaat, Hubert (2006). Germans No More: Accounts of Jewish Everyday Life, 1933–1938. Berghahn Books. pp. 17–8. ^ "Holodomor Facts and History: chronology of events surrounding the famine". ^ Vallin, Jacques; Meslé, France; Adamets, Serguei; Pyrozhkov, Serhii (2002). "A New Estimate of Ukrainian Population Losses during the Crises of the 1930s and 1940s" (PDF). Population Studies. 56 (3): 249–264. doi:10.1080/00324720215934. PMID 12553326. ^ coming into force January 1934. Black, Edwin (2001). IBM and the Holocaust. Crown / Random House. p. 93. ^ a b Palmer, Alan; Veronica (1992). The Chronology of British History. London: Century Ltd. pp. 376–377. ISBN 0-7126-5616-2. ^ "First Krispy Kreme doughnut shop found home in Nashville". The Tennessean. ^ "Vale Colin Brumby (18/06/1933 - 3/01/2018)". abc.net.au/classic/features/vale-colin-brumby/9301580. Retrieved January 6, 2018. This page is based on the Wikipedia article 1933; it is used under the Creative Commons Attribution-ShareAlike 3.0 Unported License (CC-BY-SA). You may redistribute it, verbatim or modified, providing that you comply with the terms of the CC-BY-SA.